Ronaldo scores in 10 Champions League matches in a row. April. 05, 2018 07:55. by Yun-Cheol Jeong trigger@donga.com. 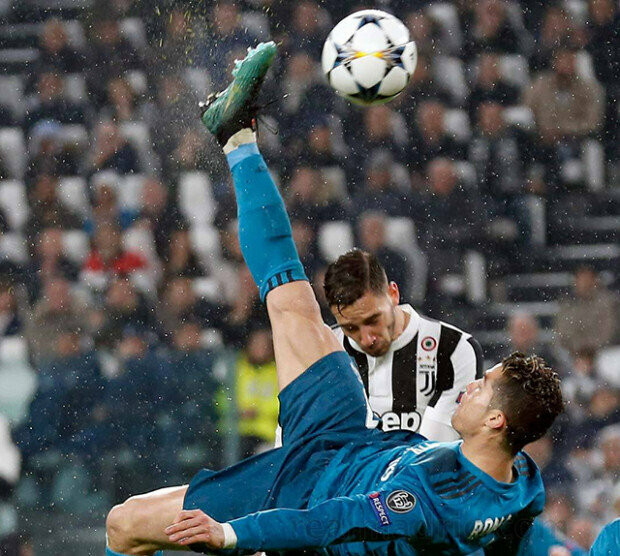 About 19 minutes into the second half, Real Madrid striker Cristiano Ronaldo jumped into the air and scored a fantastic overhead kick as his teammate crossed the ball from the side. Spanish daily newspaper Marka reported that Ronaldo jumped 1.41 meters high and kicked the ball that was in the air as high as 2.38 meters. It was a perfect combination of jump, balance, and timing. Even Juventus fans rose to applaud Ronaldo. “I didn’t expect to make it,” said Ronaldo as if he could not quite believe what happened. “Ronaldo is in the league of his own,” said Real Madrid coach Zinedine Zidane praising Ronaldo. Ronaldo scored two goals and made one assist to help his team beat Juventus 3-0 in the first quarterfinals match against Juventus held Wednesday in Torino, Italy. The second match against Juventus will be held on April 12 in Real Madrid’s hometown. Real Madrid has positioned itself favorably in the race to the semifinals with that night’s win.